I've got a shitload to do tonight again. I decided not to bring the laptop home and work from the home desktop instead because I thought I should pay a visit to Carrefour again. And I needed my hands free to carry the groceries home. I decided not to cook too so I have more time to work and to post here before I got cracking on work. So, I bought a bowl of beef noodles - the gooey, dark gravy-ed beef noodles that look like giant worms and bits of turd. WEG ... as you can see, I am really getting into the whole Halloween thing. LOL. 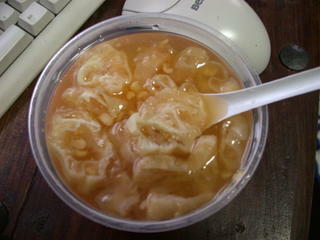 I also bought a Chinese dessert called tau suan which is like a sweet lentil soup. I really like these as I find them comforting in an odd way. But I was bloody disappointed to find that it was watery and way too sweet. Fortunately, some sixth sense told me to buy some other desserts. So at Carrefour I was bloody delighted to see two dark choccie tarts going for only $2.59. I decided to give it a try. Woah! Bloody hell they are good! It was lust at first bite ... I was a goner. My heart was racing, my mouth was watering, my eyes wide and distended with a dazed gleam ... 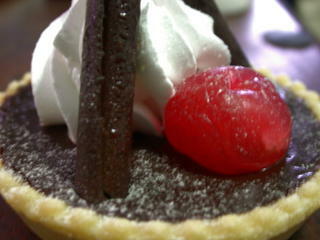 I eyed the tart in every angle, contemplating the rules of engagement. The dark, luscious gleam of the silky chocolate. The curvaceously sensuous undulations of the snow white cream. The coy dusting of icing sugar. The coiled turgidity of the sinfully dark chocolate sticks. It would be a sin to rush it ... but to go to slow was a torment on my senses. Ah feck it ... I ate it with a relish a hotdog would envy. It was sooooooo good. I applaud my own self control and saintly virtue in not devouring the second tart and saving it for tomorrow. We'll see if it can survive the night. As long as I do not awaken with an insatiable lust for choccie tart in the middle of the night, its virtue is safe from this rampaging glutton. Now that I have packed it away, I have only the pictures to leer at. Your pictures (and that would be the pictures of the chocolate tarts!) are sending me racing for my jar of international chocs so I can have a quick choc/sugar fix before going to bed! yummmmm...'eating chocs at the same time'....so much for having healthy diet for today! And 3A Gurl ... are ye who I think ye are? Habibti? DR gurl? Or the KK camp? 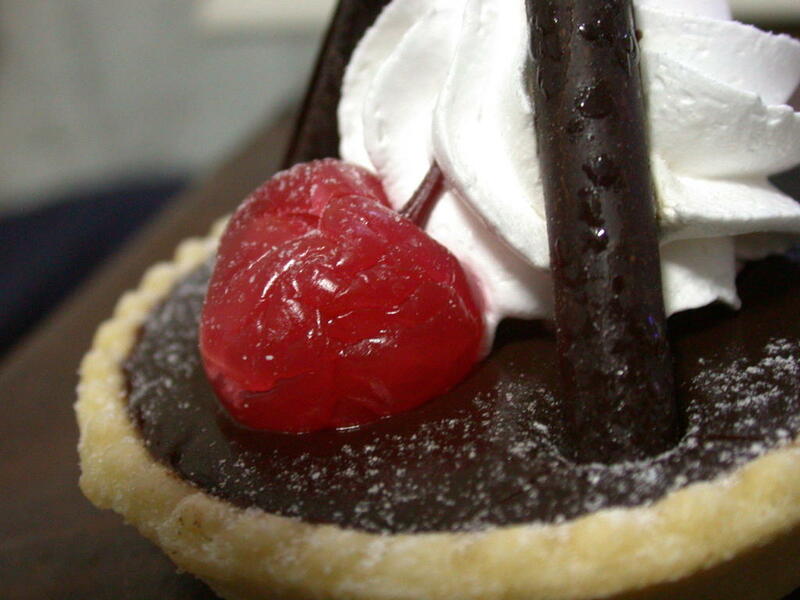 I think I am gonna go back to Carrefour tomorrow to stock up on choccie tarts for the hols. Yes, habibti, it is I and most definitely not from the KK camp, heaven forbid. Eeeee....the thought of that happening is now sending me to the choc bin again.